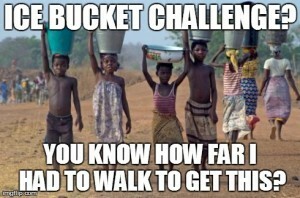 After watching so many ice bucket challenge videos online and reading the facts about how much water and energy resources are being wasted for this "charitable cause", I have decided to run an anti-ice bucket challenge to bring awareness to people that while we are amusing ourselves with dumping ice water over our heads around the world, people in Africa are dying from lack of drinking water. So, please stop wasting water and make a silent donation to other charity organizations whose donations may be suffering this year because of all this ALS hype in the social media. 08/27/14 Anonymous $46.00 This better not go to a "prince"